When Kate's husband first tells her he has taken a job in Luxembourg, her mind reels with what the move will involve. It means leaving behind her own job, one that has defined her for many years. She convinces herself it is for the best--she'd been feeling the strain between working outside the home in such a demanding job and her family since the day her first child was born. This could be the opportunity she's been waiting for to break from her old life. As she attempts to settle into her new life as a stay at home mom, socializing with the other expats in Luxembourg, she seems to be going through the motions, just playing a part. Her husband had promised to be home more and have fewer late nights working, only that isn't proving to be the case. And then there is the new American couple in town who seems a bit off. Both set off bells for Kate, and she begins to look into the possible secrets everyone, including her husband, around her is hiding. Kate can't help but wonder though if it is all in her head, remnants of her old life, of always being suspicious and never taking anything at face value. Kate herself has her own secrets, including that she once worked for the CIA. She struggles internally with whether to tell her husband, unsure how he will react. The lies came so easily for so long; she wonders if the truth will do more damage than good. The author captures very well the strain secrets can have on on a marital relationship, and I found myself wondering what would happen to Kate and her husband throughout. Chris Pavone poses some difficult ethical questions in terms of honesty and protecting the ones we love. He does an excellent job of demonstrating how no decision is exactly black and white. Kate is an interesting character. I never felt like she completely let me in, even as a reader, and yet I feel as if I understand her. I got the impression she was often just going through the motions, not really happy with her life. I think it was the burden of the secrets she carries as well as the constant lies. Much of the novel is focused on Kate's internal struggles, which I really appreciated as it added depth to the story. I have made this book sound more like a book about relationships than the thriller it is, but The Expats has plenty of thrill. The story is told in the first person narrative, with the past and present running parallel. It makes for an especially intriguing story with just enough foreshadowing to build suspense but not enough to spoil. I was quite taken with Chris Pavone's ability to surprise me with the many twists in the novel. There was rarely a dull moment. And I loved the author's way with words, at once beautiful and thoughtful. 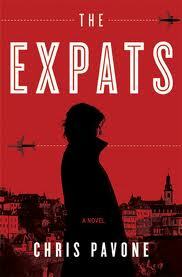 The Expats is both an intense and thought provoking book. To learn more about Chris Pavone and his book, please visit the author's website. I hope you will check out what others had to say about The Expats on the TLC Book Tours route! Many thanks to the TLC Book Tours for the opportunity to be a part of this book tour. Copy of The Expats provided by publisher. This sounds like a really good read, and I love the way you described the author's style as beautiful and thoughtful. Thanks for introducing me to this novel. Steph - It really was well written. I'm curious to see what else the author comes out with. It sounded like a thriller at first, then more about relationships, interesting. Books with secretive narrators are difficult to trust, I've found, but I like that you said you could understand Kate anyway, sounds like the author uses other methods of explanation. Sounds a good one! Charlie - I wasn't quite sure what to expect when I first read the synopsis. I'm glad it turned out to have elements of both. It took a while to warm to Kate, and I'm not really sure I completely did by the end of the book, but I still really enjoyed the book. A thriller that includes relationships sounds like a winner to me! Kathy - I agree! It gives a novel much needed depth. I was looking forward to your review of this book and I'm thrilled that you enjoyed it. It sounds very interesting on a few levels and the fact that Kate doesn't completely let the reader into her life seems to jive with her secretive professional life. She's used to hiding a part of herself from everybody. I'm intrigued about Chris Pavone's writing style, too so this is definitely going on my tbr list! Amy - It was a complex book; one well worth reading! this one actually sounds pretty cool to me. Just lately I've taken a liking to suspense filled books...now I'm adding it to my 2013 Pinterest board! Staci - I hope you like it if you do read it. It's not quite as fast paced as some thrillers I've read, but it's a good one. Great review. This sounds like the kind of book I'd pick up in a library but probably wouldn't buy. Tracy - I understand. I hope you get a chance to read it if you decide to! I saw the author on "Face the Nation" a month or so ago when they aired their annual book episode yet your review has intrigued me more. I will definitely be adding this to my list. Lisa - I bet that was interesting! I will have to see if I can find an interview with the author. I'm really curious about his take on the book. Sounds interesting and I like the idea that it is a thriller but has plenty more to keep me interested. Kathleen - Yes, this book is more than just your typical thriller. I've had this one sitting on my shelf for a while now. It arrived unsolicited and I wasn't sure if I was going to read it or not. I'm glad to hear you liked it. Guess I'll have to think about getting around to reading it one of these days.